392 North Woodside Road, Glasgow. Opened in 1955 by licensee Mrs Marie Aitken. World famous actor Duncan Macrae did the opening ceremony and pulled the first pint. The premises were built in period style and decorated with pewter pots with bright flowers hanging from the rafters. The bar fittings were installed by Messrs Gaskell and Chambers. Mrs Aitken formerly had premises at no 262 North Woodside Road which had been in the same family since 1877. 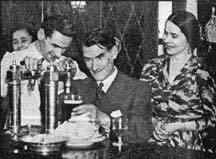 At the opening poring the pint Mr Duncan Macrae, Mr P Farmer, Manager and Mrs Marie Aitken. 1955. The Pewter Pot has a wonderful beer garden to the rear of the premises. 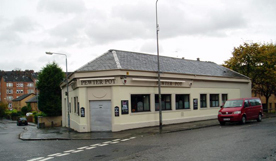 The Pewter Pot in North Woodside Road has just closed its Doors. Tonight it has closed its doors for the last Time. Its an end of an Era for this great Pub. It has been said that the Pewter Pot will be demolished to build new student accommodation in the form of flats. It is a shame to see this great bar close.